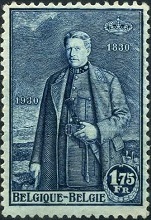 Belgium stamps during 1929 and 1930 included two new definitive postage stamp series, as well as commemorative and special issues. The fourteen lower denomination Belgium stamps shown above were issued between 1929 and 1932. These new definitive postage stamps feature the Belgian Coat of Arms, instead of the usual portrait of the monarch. All of these stamps are typographed and perforated 14. 1 C. (1929 - Scott #198) - Orange. 2 C. (1931 - Scott #199) - Emerald. 3 C. (1929 - Scott #200) - Red Brown. 5 C. (1929 - Scott #201) - Slate. 10 C. (1929 - Scott #202) - Olive Green. 20 C. (1929 - Scott #203) - Bright Violet. 25 C. (1929 - Scott #204) - Rose Red. 35 C. (1929 - Scott #205) - Green. 40 C. (1930 - Scott #206) - Red Violet. 50 C. (1929 - Scott #207) - Deep Blue. 60 C. (1930 - Scott #208) - Rose. 70 C. (1930 - Scott #209) - Orange Brown. 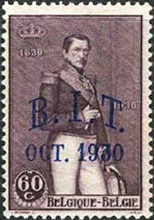 75 C. (1930 - Scott #210) - Dark Blue. 75 C. (1932 - Scott #211) - Deep Brown. All of the stamps in this set, except for the 1 C., 2 C., 3 C., and 20 C. denominations, come in tête-bêche pairs from the booklet sheets. All of the stamps in this set, except for the 1 C., 2 C., 3 C., and 20 C. denominations, exist in vending booklets, with panes of four stamps and two commercial advertising labels. These advertising labels are often collected in horizontal pairs, with the adjacent postage stamp. There are many different varieties of these labels, with each stamp denomination having multiple label types. Some of them are VERY expensive! Several examples are shown above. The four high denomination Belgium stamps shown above were issued on January 25, 1929. These new astoundingly high denomination definitive postage stamps feature the profile of King Albert I. All of these stamps are engraved, and they are either perforated 14 1/2 or perforated 14. 10 F. (1929 - Scott #212) - Dark Brown. 20 F. (1929 - Scott #213) - Dark Green. 50 F. (1929 - Scott #214) - Red Violet. 100 F. (1929 - Scott #215) - Brownish Lake. 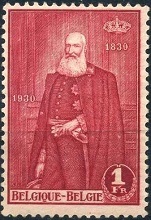 The three stamps shown above were issued on July 1, 1930 (Scott #218-220) to commemorate the 100th Anniversary of Belgian Independence. The designs feature paintings of the Belgian monarchs, King Leopold I, King Leopold II, and King Albert I. 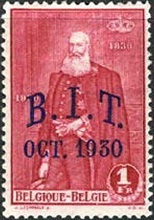 During October 1930, the Independence commemorative stamps were overprinted with "B. I. T. / OCT. 1930" (Scott #222-224) to celebrate the 50th Meeting of the International Labor Bureau in Brussels. They are shown above. 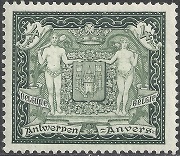 The stamp shown above was issued April 26, 1930 (Scott #216) for the Antwerp Exhibition, a colonial and maritime exposition held from May 3 to November 3, 1930. The stamp features a 1623 self-portrait of Sir Peter Paul Rubens (1577-1640), one of the greatest Flemish painters of the Baroque Era and a resident of Antwerp. The stamp shown above was issued April 26, 1930 (Scott #217) for the Liege Exhibition, an industrial and scientific exposition held from May 3 to November 3, 1930. 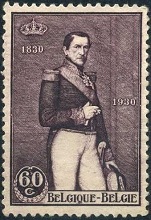 The stamp features a portrait of Zenobe Gramme (1827-1901), a famous Belgian electrical engineer from Liege. The stamp shown above, part of a souvenir sheet, was issued August 9, 1930 (Scott #221a) for the Antwerp Philatelic Exhibition, held from August 9 to August 15, 1930. 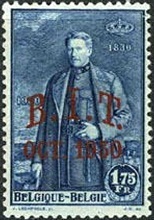 The souvenir sheet measured 142 mm x 141 mm, and it contained one stamp in the center. Each ticket-holder at the exhibition was allowed to buy one souvenir sheet. They were not available for sale anywhere else. The design features the Arms of the City of Antwerp (Anvers).